Female inmate numbers are expanding at the Shelby County Jail. The female population in the Shelby County Jail has grown by about 50 percent over the last three-and-a-half years, according to the latest jail figures. In January, the jail had 201 female inmates. 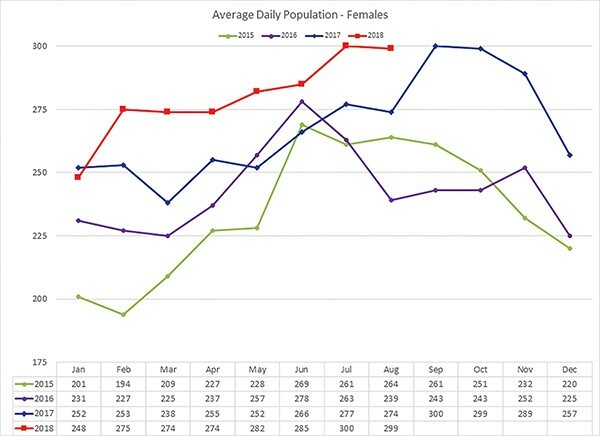 By August 2018, the jail had a daily female population of 299. Over those many months, the population has never been higher than 300 or lower than 194. Anthony Buckner, the interim Public Information Officer for the newly elected Sheriff Floyd Bonner, said the issue is complex. The jail houses many detained by different law enforcement agencies across the county. But maybe the biggest problem, he said, was the length of time it takes to conclude felony cases, particularly after an indictment. Female inmates numbers since January 2015. Josh Spickler, executive director of Just City, said the increase is "remarkable." "It led me to question what we're doing that impacts women so differently," Spickler said. "I don't necessarily have an answer." But Spickler guessed that it may have something to do with the fact that women typically earn less than men and have less access to wealth than men do. Spickler said incarcerating a woman is "much, much worse" in Memphis because of the domino effect it has on the community. Women are typically the primary care-givers here and typically the breadwinner. "The domino effect of this on families, and children, and homes is much more destructive than if this was happening to men, because the primary role that women play in children's lives," Spickler said. Buckner said Sheriff Bonner "is greatly concerned about the increase" and is now working on a plan to fix it. "We obtained a grant and are receiving assistance to develop a case management system to address [the length of stay issue]," Buckner said. "We are working with the judiciary, prosecutors, defense counsel, pretrial services, specialty courts, and many others on issues such as increasing the use of misdemeanor citations in lieu of arrest, bond amounts, increasing the use of monitors, and accelerating the appointment of counsel." Across America, about 96,000 women were in local jails like the Shelby County Jail last year. Of those, 58,000 had not been convicted of a crime. They sat waiting on court dates or could not buy their ways out of jail on a bond. The Prison Policy Initiative said poverty was, indeed, the likeliest indicator of why women face pre-trial incarceration. "Women who could not make bail had an annual median income of just $11,071," according to the report. "And among those women, black women had a median annual income of only $9,083. "When the typical $10,000 bail amounts to a full year's income, it's no wonder that women are stuck in jail awaiting trial." Spickler said when people sit in jail not because they're a danger or they're a flight risk, they only sit there because of poverty. "They cannot buy their way out of that jail," he said. "That is a really, really, dumb — for lack of a better word — use of our jail."